In the early morning of Wednesday 07/03/2018, Recon Security Patrol Officer, Jeanette, was completing her nightly patrol of Sims Pacific Metals in Favona, Auckland, when she discovered a fire in the yard. Being a scrap metal yard, this fire spread quickly. 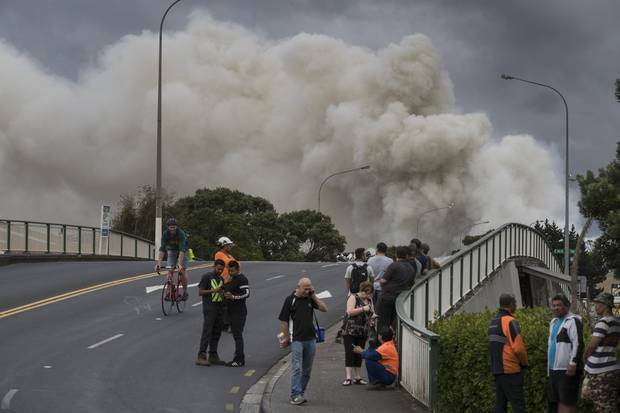 As stated by New Zealand Herald, at the peak of the incident there were 1600 tonnes of car parts, roofs and tyres ablaze, leading to smoke spreading kilometres. More than 80 firefighters and 20 fire engines worked day and night tackling this blaze, which is still burning today. After noticing the fire, Jeanette took immediate action, calling Fire Services as well as Recons Communications Office to make contact with Sims Pacific Metals key holder. Jeanette then proceeded to move on traffic, ensuring that the entrance of the site would not be blocked for the arrival of the fire engines. Once the Fire Services arrived on site, Jeanette continued to assist with traffic control and wherever else she was needed. She remained on site for the key holders arrival, so she could relay all her findings. Jeanette’s quick thinking along with her professional actions lead to the fast and easy arrival of Fire Services, allowing them more time to tackle the blaze before it got completely out of control. Jeanette’s actions also potentially saved Sims Pacific Metals thousands of dollars in damage. Recon Securitys success can be accredited to the hard work, professionalism and efficiency of its officers, officers like Jeanette. Too often, large security companies try to skimp any way they can, offering low wages and minimal training and this leads to not only poor staff satisfaction but also poor customer service. Here at Recon Security, we treat our staff as the valued professionals they are working studiously to provide extensive staff training, so that in the face of any incident, they have the knowledge to act efficiently and quickly and without any hesitation.